President Donald Trump speaks during a dinner with North Korean leader Kim Jong Un, Wednesday, Feb. 27, 2019, in Hanoi. The White House restricted press access Wednesday to portions of President Donald Trump's summit with North Korean leader Kim Jong Un in Vietnam after reporters asked questions about his former lawyer Michael Cohen's testimony, that was critical of the president. The entire 13-person press pool was permitted to cover the first two events that Trump and Kim held at the Metropole hotel in Hanoi on Wednesday: a formal greeting and the opening of a sit-down meeting. At the first of those events, reporters asked three questions of Trump about the negotiations. He answered all three. At the second event with Kim, an Associated Press reporter asked Trump a question about Cohen, who was due to testify hours later in Washington. In written testimony released in advance of the appearance, the president's former lawyer and fixer called Trump a "racist" and a "conman" and claimed Trump knew ahead of time that WikiLeaks had emails damaging to Democratic rival Hillary Clinton's campaign. Trump did not answer the Cohen question, instead shaking his head and frowning. A short time later, Sanders told the press pool that no reporters would be allowed into Trump's sit down dinner with Kim, the leader of a country where there is no press freedom. But after photographers said they would not cover the event without an editorial presence, one print reporter and radio reporter were allowed in. 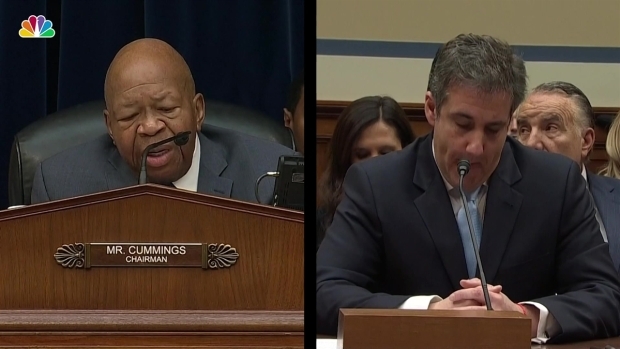 Rep. Elijah Cummings, D-Md., questions Michael Cohen about alleged hush money payments made on behalf of President Donald Trump to cover up an alleged affair. Reporters from the AP, Bloomberg News, Reuters and The Los Angeles Times, however, were barred. The Washington Post reports The Wall Street Journal's Vivian Salama was the only print reporter allowed and did not ask questions of Trump at the dinner. The decision to clamp down on media coverage Wednesday was an abrupt change of plans. The White House had previously said that access would be granted to the usual 13-person group of reporters, known as the traveling press pool, who follow the president to every event. AP spokeswoman Lauren Easton said the company "decries such efforts by the White House to restrict access to the president. It is critically important that any president uphold American press freedom standards, not only at home but especially while abroad." White House Correspondents' Association president Olivier Knox said in a statement that the organization "strenuously objects" to the restrictions. "This summit provides an opportunity for the American presidency to display its strength by facing vigorous questioning from a free and independent news media, not telegraph weakness by retreating behind arbitrary last-minute restrictions on coverage," said Knox. "We call on the White House to not allow a diminution of the previously agreed-to press complement for the remainder of the summit." 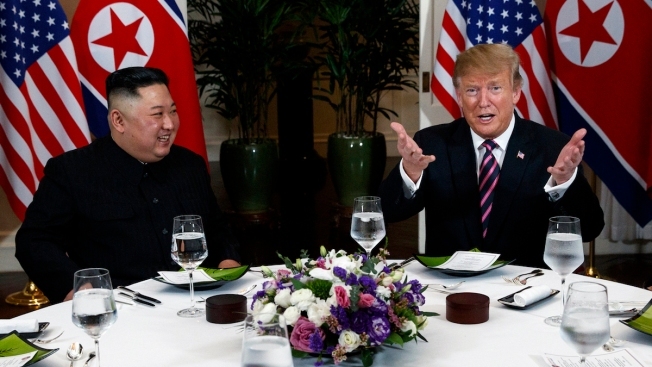 President Donald Trump fawned over North Korean Leader Kim Jong Un at the kickoff of a second summit between the United States and North Korea, this one held in Hanoi, Vietnam. "[North Korea] has tremendous economic potential," Trump said to Kim. He later praised the "special relationship" between the two countries during dinner. It wasn't the first time that the White House has excluded specific reporters. Last year, a CNN correspondent was barred from attending an open press event because, she said, White House officials deemed her questions "inappropriate." The White House disputed that characterization. Trump has a complex relationship with the press, routinely maligning news stories, outlets and reporters he doesn't like as "fake news," while at the same time taking questions more frequently than some of his predecessors. Earlier in the week, the White House press corps was ousted from its workspace at the hotel where Kim was staying after Kim apparently objected to the setup. The decision was announced by the Vietnamese government.